I got a break and pounded out the code for the vanishing point graphic. Isn't it purty? I now blog. The primary reason why I wanted to begin Rich Theory (a refutation of Transfinite Theory) with an essay on perspective was to introduce the concept of the vanishing point. The vanishing point is a real thing that appears when one projects a three dimensional space onto a two dimensional surface. It is not just a contrivance of artists run wild. You will find vanishing points in photographs and mechanical drawing techniques. The vanishing point is real and it can be identified discretely. People can use the vanishing point in their various doing. In perspective drawing, artists start by identifying a vanishing point. They then draw straigh guidelines from the point and use those to determine the relative size of the objects in the picture. Reducing by a dimension involves division. The relative size of objects in a picture is determined by the equation 1/n, where n is the distance of the object from the viewer. This is a dramatic equation! So, you will notice in the picture that the second pole is half the length of the first. The straight guidelines in perspective pictures are real as well. They appear because the vertical and horizontal are ruled by the same mathematics. They are both ruled by the equation 1/n. The second pole is half the size of the first. It's position is half way between the first pole and the vanishing point. The third pole is a third the size of the first. 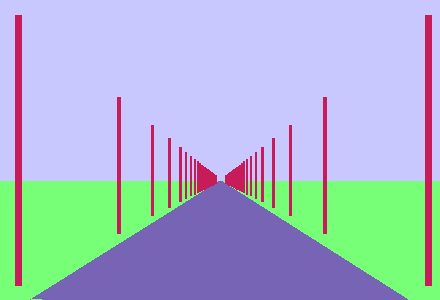 It's position is two thirds of the way between the first pole and vanishing point. There are 50 telephone poles in the picture. The closest few take up most of the picture. The rest blur into a single triangular blob. I could have drawn a hundred poles without adding much to the picture. The vanishing point and straight guidelines are real things that you can find on a two dimensional surface. Here's the kicker. The vanishing exists on the 2D representation, but it does not exist in the 3D space represented by the 2D surface. Roads don't vanish on the horizon. Both the vanishing point and straight guidelines are optical illusions. The don't exist in the 3D space, but are created by the the process of mathematical projection*. It is my opinion that a great deal of the complexity of mathematics (calculus and transfinite theory in particular) is the result of mathematicians getting caught up in the logic of the representation of mathematical ideas and not the real substance of the subject which is this weird multidimensional space. For example, the article mentions that one can define the vanishing point as the limit of a series. There is truth to this statement. However, I find it better to describe the vanishing point as a manfestation of the relation between the viewer and the frame of the picture. This is all so super profound. * (mathematical projection is different from psychological projection).